From the first paragraph, One Winter’s Day had my mouth watering with thoughts of delicious, winter spiced baking. This is the story of Ama, Tessa and Natalie who run a wedding planning company called Wedding Belles in a town called Bellegrove in the southern part of the States. Ama creates those wonderful cakes which made my mouth water, Natalie designs beautiful wedding gowns and Tessa organises everything else, such as the venue, the flowers, the entertainment. 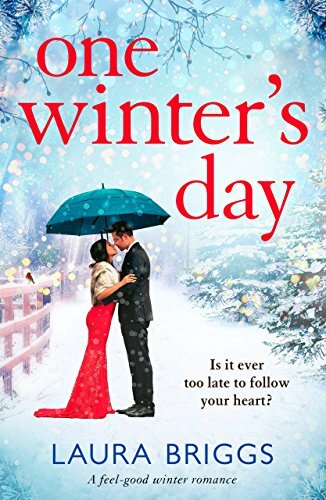 In One Winter’s Day, the women are working on a winter themed wedding and being seriously challenged, not by a demanding Bridezilla, but by her mum and future mother in law who both have very different ideas about what makes a perfect wedding! As the big day gets closer, it seems that everything which can go wrong does go wrong and it was hard not to feel for the women who were working so hard to give the bride and groom a memorable day. I think that gorgeous cover sums up the kind of wedding they hope to make possible for Nadia and Lyle. As well as following the wedding preparations, we also follow the developments in each of the women’s love lives. Ama’s family are very traditional and keen for her to use a matchmaking site to find a nice Indian boy. She is not keen on this idea at all especially after meeting handsome biker Luke. Tessa has a crush on Blake, a jack of all trades who has been working on the building where the business is based. It seems, though, that he may be rather taken with beautiful interior designer Mac. And finally there is Natalie whose large Italian family is keen to see her settled and are delighted when she meets Chad, an adventurer who loves to travel. I enjoyed reading about the ups and downs of these romances and with none of them completely resolved, it looks like we might be getting to follow the story of the Wedding Belles in another book. One Winter’s Day is an easy to read and enjoyable feel-good story. It’s just right to read by the fire on a chilly night.